Meanwhile, in 12-inch nonstick skillet, cook sausage and onion over medium-high heat 5 to 7 minutes, stirring occasionally, until sausage is no longer pink and onion is tender; drain. Stir in celery, zucchini, tomato sauce, diced tomatoes and mushrooms. Heat to boiling; reduce heat. Cook 5 to 10 minutes. Remove from heat. Add cooked pasta; stir gently to mix. Pour into baking dish. Spray sheet of foil with cooking spray; place sprayed side down on baking dish, and seal tightly. Bake 15 minutes. Uncover; sprinkle with cheese. Bake uncovered 5 to 10 minutes longer or until casserole is bubbly and cheese is melted. 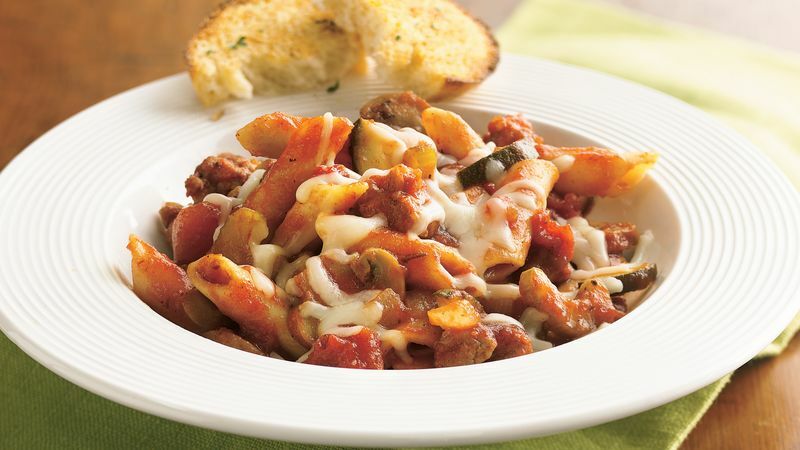 Rigatoni or fusilli can be used in place of the mostaccioli or penne. Try fresh mozzarella in this recipe. Made from whole milk, it is softer and less elastic than regular mozzarella, which is made from skim or part-skim milk.